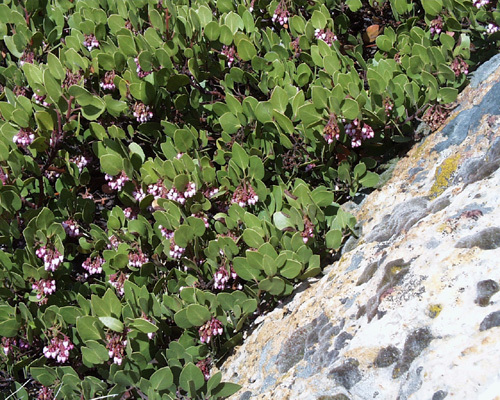 Most common in the Great Basin and much of the Sierra Nevada. Locally in Klickitat County. Open coniferous forests with dry, well-drained sandy loam to silty loam soils. This plant is a stress tolerator. It is best to collect during late fruit development by hand or by picking fruit off the ground. Seeds require hot water scarification followed by cold stratification at 4°C for 90 days in moist sand. Clean the fruit by macerating and separating the nutlets by floatation or blowing. Pre-soak dried seed in boiling water for 10 - 20 seconds or burn some straw on top of them and then stratify at 2 - 5°c for 2 months. Seed - best sown in a greenhouse as soon as it is ripe. The seed usually germinates in 2 - 3 months at 15°c. When large enough to handle, prick the seedlings out into individual pots and grow them on in a cold frame or greenhouse for at least their first winter. Plant out in late spring or early summer. Cuttings of side shoots of the current season's growth, 5 - 8cm with a heel, August to December in a frame. The cuttings are very slow and can take a year to root. This species is very dificult from cuttings. Greenleaf manzanita grows on dry, well-drained sandy loam to silty loam soils. Seedlings grown in the greenhouse have the best chances for survival. Cuttings can be used but are very difficult to root as are divisions. Water moderately for first year. Up to 2 meters tall and 3 meters wide.